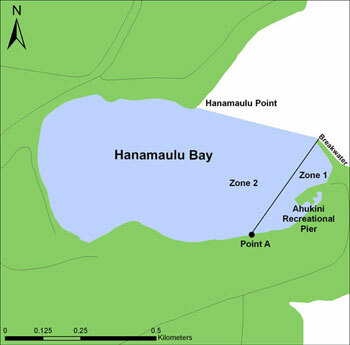 Location The regulated region of the Hanamā‘ulu Bay Fisheries Management Area is that portion of the bay, from the highwater mark seaward, bounded by a straight line from the tip of the breakwater westward to point “A” as shown. The Ahukini recreational pier is a public fishing pier, and a facility of the Division of State Parks. Rules of the State Park system also apply to use of the facility. To use any draw, drag, seine, or other type of net except thrownet and crab net. To use any thrownet or spear within 50 yards of the Ahukini recreational pier, or from the adjoining pier frame. To snag any fish or possess any thrownet while on the Ahukini recreational pier. To take or possess more than 75 akule per person per day. To take or possess more than 5 mullet per person per day. Location Kapa‘a and Waika‘ea Canals are located in the city of Kapa‘a on the east coast of Kaua‘i. Permitted To take any legal size fish in season with one line, or one rod and line, with no more than two hooks. To take crabs with not more than 10 nets, provided the nets are not more than two feet in diameter. To take shrimp for bait with a hand net, provided that the net is not more than three feet in any dimension. 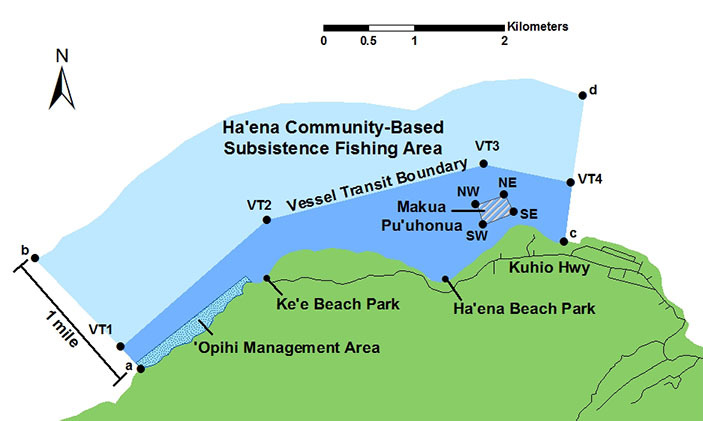 Commercial Marine licensees with a Bait License may take nehu, iao, and other authorized baitfish for bait purposes. Licensed pond owners or operators may take young mullet (pua) or other small fish for stocking their fishpond. Prohibited To fish for or take aquatic life, except as indicated in permitted activities above. 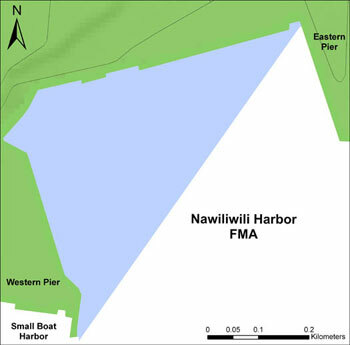 Location The regulated region of the Nāwiliwili Harbor Fisheries Management Area is that portion of the harbor, from the highwater mark seaward, bounded by a straight line from the southernmost tip of the western pier northeast to the corner formed where pier 1 meets the eastern pier, as shown. Prohibited To use any net, except a landing net not more than 3 feet in any dimension, excluding handle. 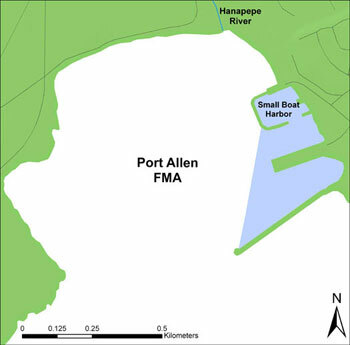 Location The regulated region of the Port Allen Fisheries Management Area is that portion of the Port Allen waters, from the highwater mark seaward, bounded by a straight line from the tip of the main breakwater northward to the bend in the breakwater of the small boat harbor, as shown. 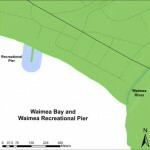 Location Waimea Recreational Pier is a public fishing pier located in Waimea Bay on the southern coast of Kaua‘i. 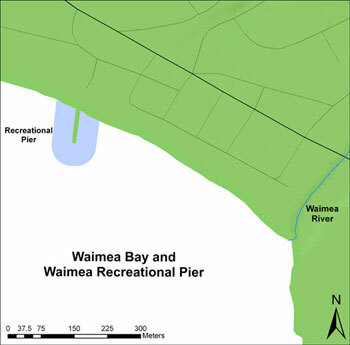 The Waimea Recreational Pier is a facility of the Division of State Parks. Rules of the State Park System also apply to the use of the facility. 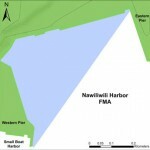 Prohibited Within 50 yards of the Waimea Recreational Pier, to use any spear, trap or any type of net except crab net. – fish from any space between the marks already occupied by a fisherman. 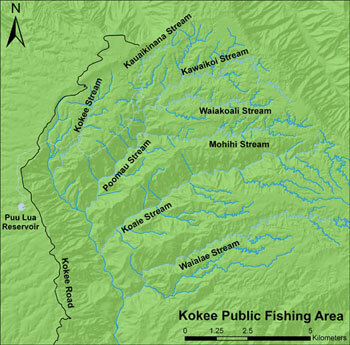 Location The Kōke‘e Public Fishing Area includes certain streams, reservoirs and ditches in the Kōke‘e State Park on Kaua‘i. Permitted With a valid Freshwater Game Fishing License, to fish with one pole and line or one line using one baited hook attached to the single line, or possess any rainbow trout during the open season, as announced by the Department on or about January 1 every year, provided that all fishermen report before and after fishing activities to designated checking stations. Anglers may fish daily between 6:00 am and 6:00 pm during the announced open season. To use a dip net up to two feet in longest axis, excluding the handle, to land hooked trout. To take up to the announced bag limit of trout per licensee per day during the open season, provided that additional legally taken trout may be possessed under refrigeration. Prohibited To fish for, take or possess any rainbow trout except as described in permitted activities above. To use any form of corn for bait. To use treble hooks or more than one hook. To possess spears, chemicals, trotlines, nets (except as indicated in permitted activities above) or other illegal fishing gear. 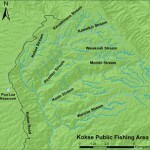 To enter into or fish in the prohibited fishing zone along a portion of Kokee Stream and its tributaries above Camp Sloggett, or any other area which may be posted as a prohibited fishing zone. To damage or mutilate any private or public property, or contaminate or pollute any stream, ditch, spring, water hole or reservoir. To operate any vehicle in any fishing area except on roads for vehicular use, or use any aircraft to gain access for fishing purposes. 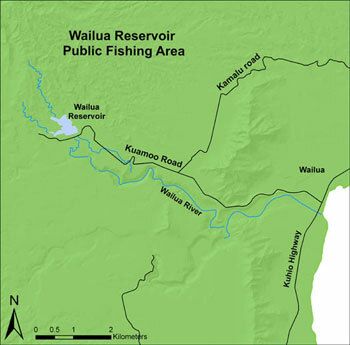 Location The Wailua Reservoir Public Fishing Area is located off Kuamo’o Road approximately five miles mauka of Kūhi‘ō Hwy, above the city of Wailua on Kaua’i. 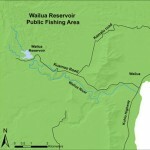 Permitted With a valid Freshwater Game Fishing License, to fish using one pole and line, or one line with one lure or baited hook attached to the single line. To use a dip net up to two feet in longest axis, excluding the handle, to land hooked fish. To take up to an aggregate total of three fish per licensee per day, provided that fishers must allow inspection of any bag or container, or any vehicle or other conveyance used to carry or transport aquatic life. To fish only during the day (no night fishing). Prohibited To fish for, take or possess any fish except as described in permitted activities above. To possess spears, chemicals, trotlines, or nets, except as indicated in permitted activities above. To possess or use any live animal or plant as bait. To enter into or fish from any irrigation infrastructure, including catwalks, valve towers, or ditches. To launch or use any vessel or floatable object, motorized, non-motorized, or wind-powered, in the reservoir. To swim, bathe, or conduct any activity in the reservoir other than fishing. To enter into or fish for any aquatic life at any portion of the reservoir designated as a wildlife or waterbird sanctuary. To contaminate or pollute the reservoir, ditch, or stream. Bag and size limits Bluegill: Bag limit 2, minimum size 7 inches total length (TL). Smallmouth bass: Bag limit 2, min. size 9 inches TL. Largemouth bass: Bag limit 2, min. size 9 inches TL, max. size 14 inches TL. Tucunare: Bag limit 2, min. size 12 inches TL, max. size 15 inches TL. Note: bag limits are listed for individual species. The aggregate total bag limit of three fish applies. Location The Hā‘ena Community-Based Subsistence Fishing Area (CBSFA) includes the waters and submerged lands from the shoreline to a distance of one mile off the northwestern coast of Kaua‘i, bounded by a straight line extending seaward at the boundary between Hā‘ena State Park and Nā Pali State Park, and a straight line extending seaward at the boundary between Hā‘ena and Wainiha, as shown. Permitted Pole spears 8 feet or less. Up to two fishing poles per person, with no more than two hooks per line. Pa‘ipa‘i net or surround gill net fishing methods, as long as the nets are deployed from shore or from a vessel less than 14 feet long. Two people must be within five feet of the net at all times while it is deployed. Scoop nets, but may not be used at night (between 6:00 pm and 6:00 am). Limit of three specimens of marine life may be taken with scoop net per day. Taking of limu by hand harvest only. Vessels with prohibited gear onboard may transit through the CBSFA as long as they remain outside the Vessel Transit Boundary (see boundaries below). Taking of live or empty shells while using SCUBA. Spearing at night (between 6:00 pm and 6:00 am). Selling or offering for sale any marine life taken from within the area. Possession of prohibited fishing gear, except outside the Vessel Transit Boundary. Taking, altering, defacing, destroying, possessing, or removing any sand, coral, rock, or other geological feature or specimen. Bag limits ‘Opihi, pipipi, kūpe‘e, and pūpū: no harvest through November 30, 2017. Beginning December 1, 2017, limit of 20 total combined per day from the ‘Opihi Management Area only. Lobster: limit of two per day, hand harvest only. Urchins: limit of five per species per day. He‘e: limit of two per day; may be taken only by hand harvest or with a stick no more than two feet in length. 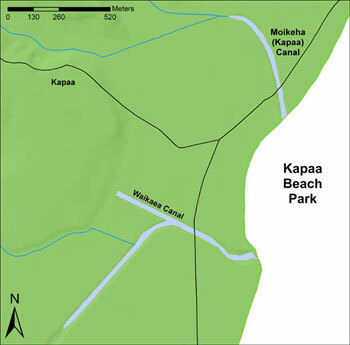 Waters and submerged lands from the shoreline to a distance of 300 feet, from the Hā‘ena/Nā Pali boundary of the CBSFA to a line extending seaward at the western edge of Ke‘e Beach, as shown. 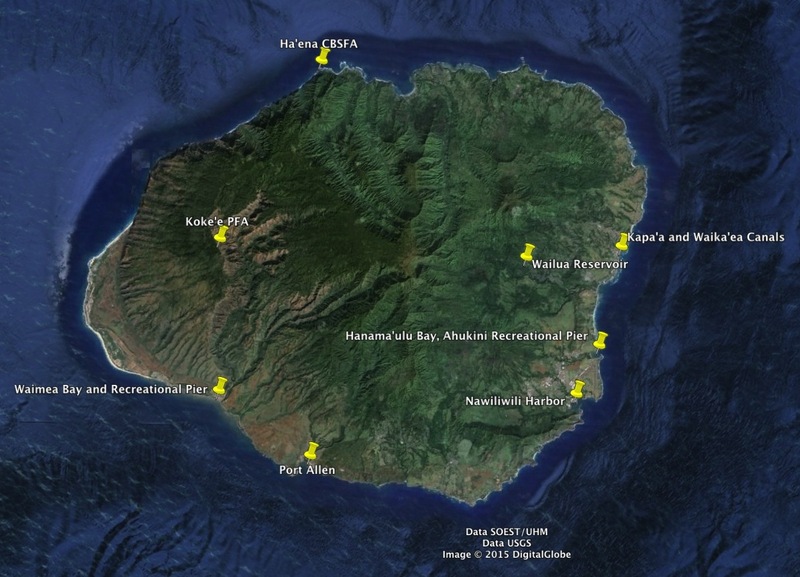 Only place where ‘opihi, pipipi, kūpe‘e, and pūpū may be harvested, beginning December 1, 2017. Waters and submerged lands of Makua lagoon; a four-sided area bounded by straight lines between the points as shown, with the following coordinates. No entry without a special activity permit (applies to vessels and individuals). 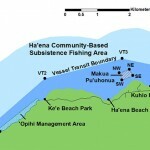 Waters and submerged lands bounded by a line drawn along the CBSFA boundary from the shoreline between Hā‘ena State Park and Nā Pali State Park (Point “a”) at 22012’42.50″ N, 159035’44.50″ W to a point 1,000 feet offshore at 22012’49.98″ N, 159035’51.79″ W (VT1), eastward to a point 1,300 feet offshore at 22013’35.57″ N, 159034’59.73″ W (VT2), then to a point 2,300 feet offshore at 22013’55.42″ N, 159033’42.00″ W (VT3), then to a point 2,100 feet offshore at 22013’48.84″ N, 159033’10.76″ W (VT4), then along the CBSFA boundary to a point on the shoreline between Hā‘ena and Wainiha (c) at 22013’28.00″ N, 159033’13.50″ W, as shown. Allows vessels with prohibited gear onboard to transit through the CBSFA as long as they remain outside the Vessel Transit Boundary. 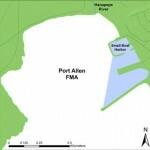 This boundary does not affect general vessel operation or access to any area.